Hormones are chemical messengers that influence every process in our body. Depending on the circumstances, the actions of these hormones can produce positive or negative effects. Flaxseed oil contains hormone-like substances. Because of this, you must exercise caution when using it since natural does not always equal safe. 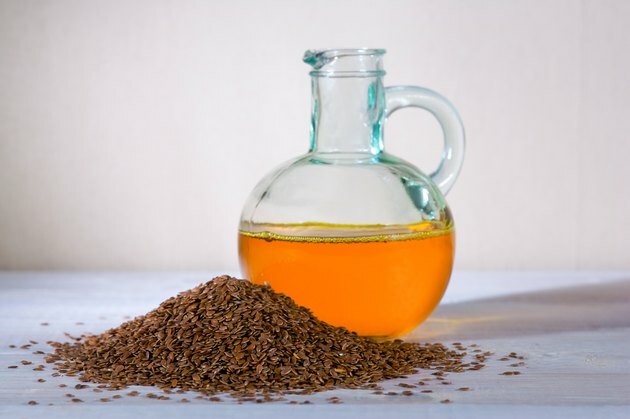 If you believe using flaxseed oil will improve your health in some way, talk to your doctor first. Flaxseed contains the richest source of lignans, a type of phytoestrogen. Phytoestrogens are weaker forms of the estrogen naturally present in the body. Because of the similarity, these substances can act in the body in a similar fashion. The estrogenic activity of flaxseed may offer some benefits, such as easing symptoms you experience while going through menopause The dramatic decrease in estrogen that occurs during this time is responsible for vaginal dryness, hot flashes and reduced bone density, among other things. The phytoestrogens in flaxseed may mitigate these effects. For example, a study published in the May 2009 issue of ‘’Menopause,’’ found that using flaxseed along with low-dose estrogen therapy led to a greater preservation of bone mass compared to just the hormone therapy tested on rats that had their ovaries removed. A study like this, of course, is insufficient to make firm conclusions about benefits. The effects of flaxseed on estrogen-dependent cancers are not clear-cut. On the positive side, the plant estrogen, not the estrogen from the body, can bind to the estrogen-receptor sites on a cell. This prevents the stronger form from attaching and causing its negative effects. A study published in the May 2005 issue of ‘’Clinical Cancer Research,’’ had recently diagnosed breast cancer patients consume a muffin daily with or without flaxseed. The researchers found the flaxseed appeared to produce several changes not found in the placebo group that suggest it may reduce tumor growth. On the other hand, the estrogenic activity of flaxseed oil might cause harm in the same way the estrogen in the body does. The University of Pittsburgh Medical Center reports laboratory studies have found the lignans stimulate the growth of breast cancer cells. They note that the mixed findings suggest many individual factors might influence whether flaxseed oil produces a positive or negative effect. If you have breast cancer or have a history of breast cancer or other hormone-sensitive cancers, definitely talk to your doctor before using any form of flaxseed. The hormonal effects of flaxseed make it prudent to avoid consuming it while you are pregnant or nursing. The University of Pittsburgh Medical Center reports studies, using both humans and animals, suggest it might cause problems with the actual pregnancy as well as alter the development of reproductive organs in your baby. Is Progesterone Supplementation With Birth Control Pills Safe?